I have so many photos to share and not nearly enough blogger space to share them in, it wouldn't even let me upload 2 together tonight! I reckon I can get a good 6 months worth of tales from this one short break, It's just been great to laugh and chat and laugh some more, i loved the crafty chatter and the general atmosphere of 2 happy families together. The children were all well behaved, Jacquis children are totally fabulous, her hubby is lovely and Jacqui is just the best hostess and the most lovely of ladies you could ever hope to meet. Now then Tilly the dog had to be one of the highlights as she's so totally adorable. 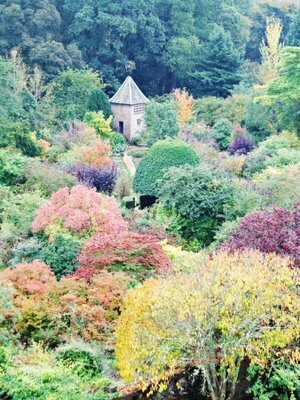 Tilly will have to wait for her starring moment as blogger is absolutely refusing to let me upload more than 1 photo, so I'll leave you with that vision of autumnal splendour, the gardens of Crathes castle which was gifted to the Burnett family by Robert the Bruce along with a very nice antiquity called the Horn of Ley. Back tommorrow with lots more piccies and tales of scottish splendour! What a fabulous photograph. Glad you had fun, despite the poor babes getting sick.